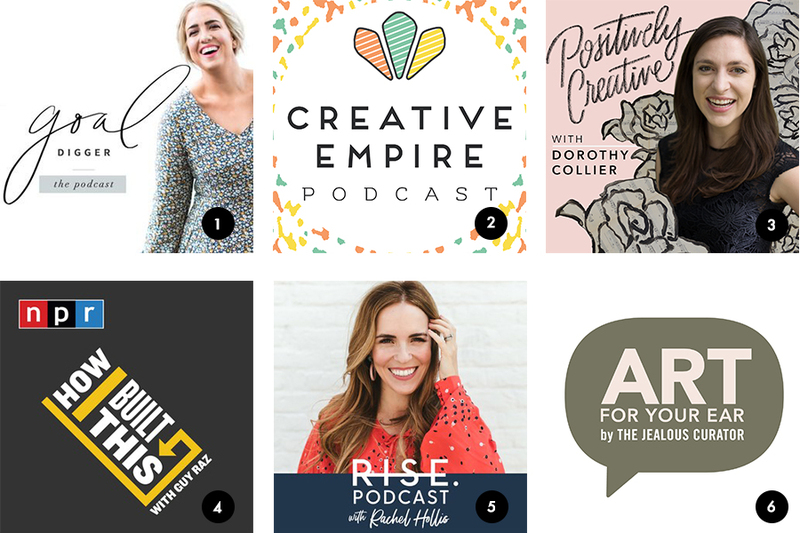 My Top 6 Podcasts for Creative Entrepreneurs — Allie Dattilio, fine artist. Okay, so I’ve hopped on the podcast bandwagon — the perfect companion in the studio, keeping me company, inspiring and educating me, all the while I’m painting away! 1) Goal Digger, the podcast with Jenna Kutcher — this was one of the first podcasts I ever listened to and converted me into a believer of all things podcasts, and Jenna Kutcher for that matter. Wedding photographer turned online marketing genius and educator, Jenna shares all of her brilliant knowledge to capture your ideal client and set yourself apart in the saturated online world, and interviews some of the biggest names in the industry. She is a pro at social media and e-mail marketing, growing her own following to over 600k people and a 7-figure business, and my ultimate business girl crush! 2) Creative Empire Podcast — with Christina Scalera of The Contract Shop and Reina Pomeroy, a business coach. Love the dynamic of these two — Christina, a down-to-earth pragmatic lawyer and Reina, a bubbly, eternal-optimist. Like your very own business fairy godmothers, sharing brilliance and tailored business coaching advice for creative entrepreneurs. 3) Positively Creative Podcast with Dorothy Collier — okay, I’m a little biased on this one, as this was my very first podcast interview! Click here to listen to my episode! Dorothy interviews some of the biggest names in the online art world and small business owners about how they are making it in their fields, like best friends chatting over a good cup of coffee. 4) How I Built This with Guy Raz — the ultimate entrepreneur podcast. Guy interviews the founders of the BIGGEST companies in the world (think Starbucks, Spanx, Warby Parker, etc) as they tell their story about how they started with nothing and went on to create some of the most powerful movements in the world. WARNING: listening to this podcast will inspire you to quit your day job, risk it all, and go after your biggest dreams! 5) RISE podcast with Rachel Hollis — Rachel is the big sister I wish I had, the one who tells you to pick yourself up off the ground, dust yourself off and try again. The author of Girl, Wash Your Face is a pint-sized powerhouse and motivational speaker! Love her take on self-help, business and relationships (her episodes with her husband, Dave are some of my favorites)— I’ve even convinced my husband to listen to her! 6) Art for Your Ear with the Jealous Curator — Danielle interviews some of the worlds biggest contemporary artists, chatting about how they got their start, their personal lives, their inspiration. For me, she takes on super-intimidating fine artists and makes them way more relatable and accessible — turns out all of us weird art people are more alike than you’d think! So there’s my rundown! Do you listen to any of these? Any others you’d recommend?